Complete your Tumor collection with the final collectibles hidden across the sprawling "final" area of The End Is Nigh -- this is the 100% completion guide for The Machine. The Machine is by far the most difficult area yet, and it's the last place you'll need to visit to get all three body parts and complete your friend. Of course, there's more to delve into and optional areas to explore, but this is the final place you'll need to hunt down Tumors. And the Tumors are pretty well hidden. Most of the secret areas feature multiple paths, and often split, so always be on the lookout for secondary secrets. Then there are the keys -- some are required to progress, but you can also get an extra key to access all those key doors in the earlier areas. NOTE: To unlock doors with a key symbol, collect the key in Zone 5: The Machine.. Another key is always located at the end of the key door paths. Tumors are the main collectible in The End Is Nigh -- there is one Tumor per level. Secret areas contain Mega Tumors, which reward you with a bundle of 5 regular Tumors. There are 20 Tumors, 7 Mega Tumors, and 1 Cartridge in every area -- for a total of 55 Tumors if you collect them all. To "save" a Tumor, you need to leave the screen without dying. If you die and don't reach a new level, you'll reset and have to collect it again. Teleport back to The End 1 and interact with your TV to play Cartridges you've found. Complete Cheevos for the Cartridge mini-games to unlock bonus Tumors. Cartridge #9: Machine 9 - The Machine 9 secret contains an additional hidden path. In the second "???" screen, ride the top-center thwomp block up into the single block hole at the ceiling. Secret #1: Machine 4 - Near the exit, grab the handhold ledge at the top of the screen (upper-right corner) that's near the top shooting gun. Hang off it to lower a path to a secret area. At the top, go right to find one Mega Tumor. Secret #2: Machine 4 - In the exact same secret path as the first Mega Tumor, just go left when you reach the "???" level from Machine 4. Secret #3: Machine 9 - Ride the single blocks through the secret exit in the bottom-right corner of the screen. Follow the straightforward path to the end to get the Mega Tumor. Secret #4: Machine 21 - Drop into the hole in the bottom-left corner of the screen. The first Mega Tumor is through the right path. Secret #5: Machine 21 - The other Mega Tumor is in the same secret path as the previous collectible. Just follow the left path instead of going right. Secret #6: Machine 22 - Hit the square button in the screen to activate a gravity lift near the start (upper-left corner) which leads to the secret path. To get the first Mega Tumor, ledge-jump into the gravity shafts in the second "???" level, and hit the weak wall on the lower-right corner. Secret #7: Machine 22 - There's a second secret Mega Tumor in the area accessible in Machine 22. When you reach the second "???" 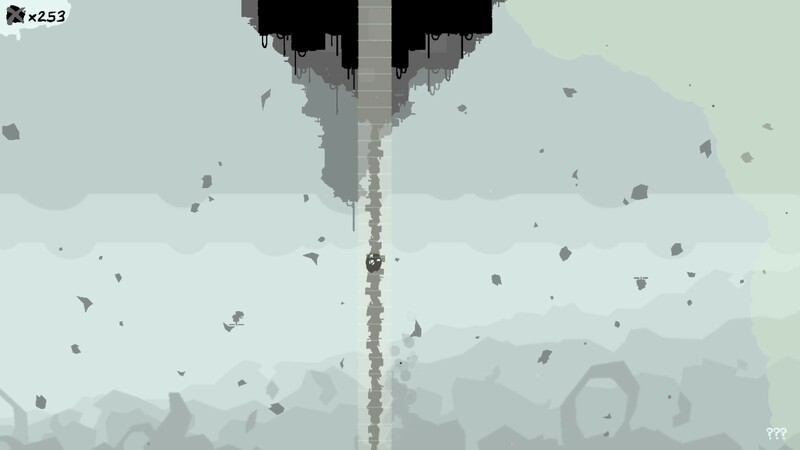 level, just ride the second gravity shaft to the top of the screen. Key #1: Machine 6 - The first key is in the upper-right corner of the screen. Use the key to unlock the door in Machine 3. Key #2: Machine 12 - Exit Machine 11 through the upper-left path to reach a room with the second key. Use it to open the locked door in Machine 13. Key #3: Machine 14 - Drop down immediately below the previous key in Machine 12. Fall into the shaft (partially obscured by white smoke) to get a key that's easy to miss. This key is important -- it's the extra key you need to complete bonus challenge paths in previous areas. Key #4: Machine 15 - Visible in the upper-right corner. After climbing the shaft, grab it while dropping down toward the exit. Use it to unlock one of the doors in Machine 16. Key #5: Machine 18 - Through the upper Machine 16 key door. Hit both buttons to unlock the "cage" containing the key in the center of the screen. Key #6: Machine 16 - Exit through the lower key door to follow the main path. The key is in the center of this unnumbered area. Machine 1: Bottom-right corner, blocked by the white smoke in the foreground. Drop down from the automatic conveyor belt handholds near the exit. Machine 2: Hang off the left-corner of the first moving platform to grab the tumor that's easily visible. Just don't stand on the platforms for too long while in the gas cloud. Machine 3: Directly beneath the tracking turret, up the conveyor belt shaft at the start. Machine 4: Once again, the tumor is hidden behind white smoke in the bottom-right corner. Jump across the gravity shafts and drop down to the handhold in the corner. Machine 5: Floats above the middle gravity shaft in the center of the screen. Use the first shaft to hang from the spiked ledge at the top of the center shaft to reach the high tumor. Machine 6: Hit the square-shaped button in the center of the moving gun wall to open a block at the bottom. Ride the conveyor up to grab the tumor before getting the first key. Machine 7: The tumor is on the bottom level, moving to the left. Quickly sprint to the top level, touch the bottom, and drop down to the gun-shooting hall to grab they tumor before it becomes unreachable. Machine 8: Floats above the first poison gas cloud. Ride the spiked balls (using the prominent ledges) to get to the right side, then ride one up and jump right to get this tumor before the gas kills you. Machine 9: Very trick. Floats around the center of the screen. Use the right conveyor to ledge-jump toward the tumor to get it -- if you time your position right, jump when the tumor floats toward the right side. Machine 10: Found in the center, beneath the upper platform. Bounce on the gas-spewing rotating bag enemies until you reach the upper-right corner, then bounce and jump left to collect the tumor. Very tough spot that requires good timing. Make sure you land on the spring to avoid death! Machine 11: Go up from Machine 10, then climb the disappearing blocks to the center. Drop down when the small "helmet" platform above the tumor disappears and avoid the spikes below. Machine 12: Top-left corner, down the left path from Machine 11. Just drop off the conveyor belt before slamming into the ceiling spikes. Machine 13: Exit Machine 11 through the upper-right path to access this screen. Get the checkpoint through the key exit, then ride the slow moving platform on the right side. Jump left to get the tumor when it floats right -- don't ledge-jump, just use a regular high jump. Machine 14: Go left from Machine 10 to access a tiny area with a single tumor guarded by some gun turrets. Machine 15: Down the lower-right corner of the conveyor belt hall. Time your jump, and you can hop over one spiked ball and get the tumor before a second spiked ball blocks your path. Machine 16: Finally, an easy one. Get to the center of the moving walls, and use the two-square high platform to reach a handhold to the left or right of the tumor. Ledge-jump across to get it. Machine 17: Floating between the third and fourth thwomp blocks. Ride one of those two and hop to get the tumor before you're smashed. Machine 18: Take the upper key door path from Machine 16, then ride the right conveyor and touch the button to reveal more conveyors on the center "cage" around the key. Ride them and hop off to grab the tumor above the spikes. Machine 20: Directly above the automatic-firing gun turret. It tracks fast and shoots bullets, so rush under it, ride the conveyor to the right, and ledge-jump left to get it. You'll have to make a second circle to hit the button, but the turret follows a predictable pattern. As long as you don't stop or turn around, you'll be fine. Machine 21: Drops down around the center of the screen, just when you jump off the second disappearing block onto the third. Hop back left while it's falling to get the last small tumor. The Machine might be the end, but The End Is Night isn't over yet. Follow the Escapist for even more secret stuff!